Below are common attributes associated to Nanho Blue Butterfly Bush. Become a care taker for Nanho Blue Butterfly Bush! Below are member comments regarding how to plant Nanho Blue Butterfly Bush. No comments have been posted regarding how to plant Nanho Blue Butterfly Bush. Be the first! Do you know how to plant Nanho Blue Butterfly Bush? Below are member comments regarding how to prune Nanho Blue Butterfly Bush. No comments have been posted regarding how to prune Nanho Blue Butterfly Bush. Be the first! Do you know how to prune Nanho Blue Butterfly Bush? Below are member comments regarding how to fertilize Nanho Blue Butterfly Bush. No comments have been posted regarding how to fertilize Nanho Blue Butterfly Bush. Be the first! Do you know how to fertlize and water Nanho Blue Butterfly Bush? Below are member comments regarding how to deal with Nanho Blue Butterfly Bush's pests and problems. No comments have been posted regarding how to deal with Nanho Blue Butterfly Bush's pests and problems. Be the first! Do you know how to deal with pests and problems with Nanho Blue Butterfly Bush? Looking for Nanho Blue Butterfly Bush? Get Nanho Blue Butterfly Bush fresh and large directly from the grower to your garden! Buy Nanho Blue Butterfly Bush online from the nursery wholesalers and save BIG! 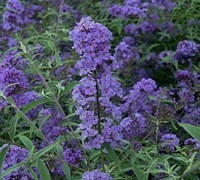 I fertalize my butterfly bush in Spring and then on an as needed basis through late Summer. I would generally recommend a slow-release granular flower food, higher in the middle number: this is phospherous, which helps to promote strong root systems, strong stems and plenty of flowers. Alternatively, you may use a natural or organic, non-burning plant food. When fertalizing, always refer to product label for application rates and instruction.